More specifically, what we'll do in this chapter is separate out our two views - the hike selector view, which will become our home page, and the edit hike view, which will become our edit hike page. This also means that our simple data model (our hikes array from the last chapter) should be split out as well, so that it's independent of the two views and can be used separately. Now, because this is a lot of ground to cover, this part of the tutorial will only go over how to split our view into separate components, not how we'll fit them back together and develop the flow of our app. 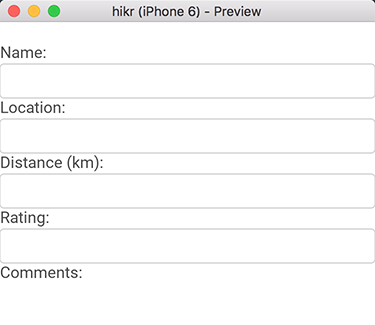 This will mean that our view for editing a specific hike will no longer be populated with any data for a little bit, but that's ok. We want to take things one step at a time. Hooking our views back together and passing data between them will be covered in the next chapter, so don't worry! However, in the case of our hikes array, we're not going to tie the module to a specific UX file. Instead, we'll just place the data into its own separate .js file, and tell Fuse to bundle this module with our app. Then, we'll import this module into each of our views' modules. All we've done here is placed a comma after the "*" entry, and added a "hikes.js:Bundle" entry after it. 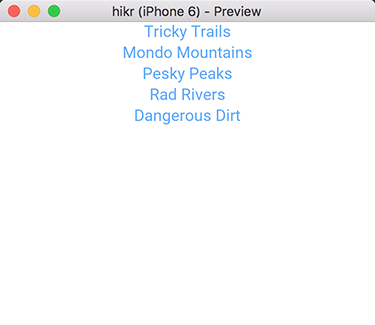 This is just saying "Hey, Fuse, you know that hikes.js file? Go ahead and bundle that with my app." Nice and simple! Now we can save this file, and we're all set. Notice how we left the reference to hikes in module.exports. This will cause an error if we save the file, but don't worry - we'll fix this up in a minute. And that's it! Now we can save this file, and our new module is ready to go. Note: You can find out more about classes in our Creating Components documentation. At this point, our page should be ready for display! By now, we've got multiple pages, and we'll need a way to display them and navigate between them. In Fuse, this is handled by the Navigator and Router components. These components will need a proper introduction, and we'll want to take our time learning how to use them properly to fully understand how powerful they are, so we'll take a look at those in detail in the next chapter. And now, when we save all of this, our new HomePage will be displayed, and we can swipe right to reveal the EditHikePage as well. Cool! Now that we've got our two views separated into different components, the next step on our journey will be to hook them back together so that our selector in HomePage will populate the editor EditHikePage and navigate to it as well. That's where we'll start developing the flow of our app using Fuse's Navigator and Router components. This is what we'll cover in the next chapter, so when you're ready, let's move on!